You are going to need travel money when you visit Bangkok and the best advice I can give is "don't put all your eggs in one basket". Take different cash sources, credit cards, debit cards, travellers cheques and cash and don't keep it all in the one place. You should not be so dependent upon one source of travel money that it ruins your holiday if you lose it or worse still it gets stolen. If you wish to be very cautious then get some Thai Baht travel money before you leave home to cover you for a couple of days. Personally I would wait until I landed and change some immediately upon arrival at the airport. 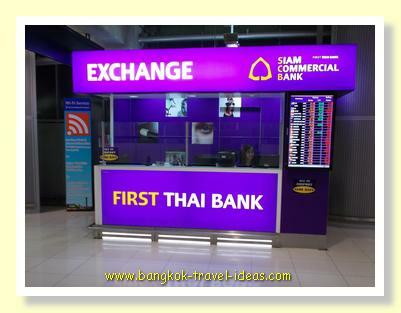 The foreign currency exchange booths are open 24 hours in Suvarnabhumi Airport, so you will have no problem on getting cash on arrival. There are currency exchange booths before immigration and also in the baggage hall, so there is plenty of opportunity to get some cash for the taxi ride. Different banks are represented in the airport and they have different exchange rates, so pick the one most favourable to your currency. Discount currency exchange booths are now open in the airport land side. You can check current rates on a link at the bottom of the page. It has been said that Banks and currency exchange booths of the same Company all display the same exchange rate at the same time. I am not so sure of this and tend to think that the airport would be more expensive, but it may be true. However what I do know is that there can be up to a 5% difference between the cheapest and dearest quote between the various banks, but only a 1% difference between the best bank rate and Super Rich Thailand. 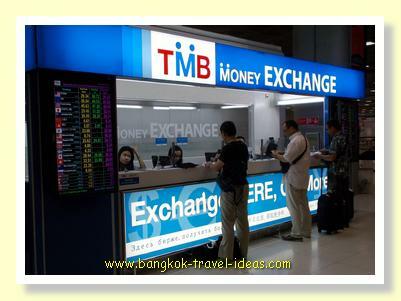 Take the rest in your home currency and you will be able to change it easily in Bangkok as there are money changing booths all over the tourist areas. Try to avoid changing money at your hotel or at a bank as you will get a poor rate of exchange. If you intend to travel away from the main tourist areas or into the country you will find it more difficult to change money and even major banks may not handle these transactions, so plan ahead. 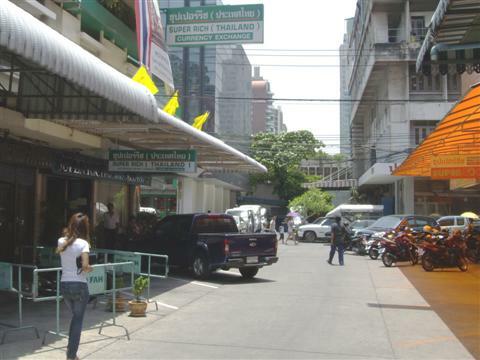 Most currency transactions in the tourist areas of Bangkok can be conducted at the little street booths without showing any identification, but be aware that banks will want to see your passport and take a copy. 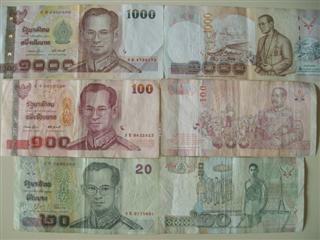 How much cash can I take into Thailand? A common question is, "how much cash can I take without declaring it to Customs." Well, most countries have a maximum amount of cash that you can take with you when you leave the country. Thailand also has a maximum amount you can bring into the country without declaration. If you exceed this limit you need to complete a declaration form or face a penalty if you are caught. The information is collected as part of anti money laundering legislation and completing the form is just a part of the reporting mechanism. If you are leaving India then you need to visit the Indian Reserve Bank website. The amount of money you can take out of India depends upon the purpose of your trip and whether you are an Indian citizen or not. You can take as much cash as you like out of Australia, but you must declare AUD $10,000 or more on leaving Australia. If you are leaving the UK then you need to declare 10,000 Euros or more. If you are leaving the US then you need to declare USD $10,000 or more. If you have more than the equivalent of USD $20,000 when entering Thailand you should make a declaration to the relevant Customs staff. Check the Customs website of your country to find out your specific travel money limits. 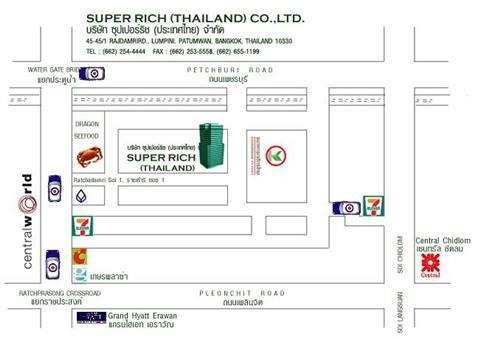 For the very best exchange rate then you need to go to Super Rich (Thailand) located at 45-45/1 Rajadamri 1, Rajadamri. Patumwan. They do have other locations now, but this is the one where you get the exchange rate listed on the Super Rich (Thailand) website. In my experience you will get 1.8% better than at Phrom Phong BTS station and maybe 2% better than in the Nana area. You will need your passport. Office Hours Monday – Friday 9.00 a.m. – 6.00 p.m. Saturday 9.00 a.m. – 4.00 p.m. They also close over the New Year period, approx Jan 1st-4th, so check their website for details around this period. If you go on a Sunday like I did once and found them to be closed, then there is another place to change money on the next soi (The one with 7-11 on it towards the left-hand side, bottom of the map). It is basically just a window in a wall and you pass your money inside and just wait on the street. It is a little bit unnerving the first time you do it. In the photo above, the orange building on the right is Superrich 1965. On a recent visit the exchange rate was the same between the two Super Rich businesses, but the queue was only 2 people inside the orange Super Rich 1965 instead of 20 people at the Super Rich (Thailand) shop. Check it out for yourself next time you go. If you are only going to change $100 then it is hardly going to be worth you while travelling to Super Rich at all. Read what happened to me when I spent half the day travelling to Pratunam to change the Australian dollar to Thai Baht. So firstly go and check out the foreign currency comparison rates of all the Bangkok Banks to work out how much you will save. These are a secure way of taking large amounts of money and worth considering. American Express, MasterCard and Visa are taken at most large establishments in Bangkok and you can use the cards to access ATM's where the Maestro symbol is displayed. You can withdraw travel money as a cash advance or as a debit from your debit card account. The biggest risk with a credit card is of it being skimmed and copied and the second biggest risk is of the credit card company cancelling the card on you whilst you are overseas. These are both likely events. To minimise both of these eventualities you should never let your credit card out of your sight. In restaurants you should get them to bring the card reader to the table, go with them and watch them swipe the card or pay cash. I always pay cash in restaurants since the time my card was skimmed in Bangkok and the thieves racked up $9000 in charges about 2 months later. Luckily for me I was able to prove that it was not me using the card and it was not a big drama to sort out. But it could have been and I might have been up for thousands of dollars of charges if I hadn't been able to prove I was somewhere else at the time and still had possession of the original card. Secondly, prior to your travel date call your credit card company and tell them you are going overseas. Most credit card companies have sophisticated fraud detection programmes that detect unusual purchases and they will ring your contact number to confirm the purchases. If you do not answer (because you are on holiday) then they will suspend your card, so make sure you advise them beforehand. Something as simple as a transaction in London and then one in Bangkok which seem to coincide will trigger a call or even a transaction at a high risk establishment in Bangkok will trigger a call. I have had many calls to my home at 4:00am to confirm a transaction whilst I was overseas and if it hadn't been for my family confirming my whereabouts my card would have been cancelled. Let the credit card company know you are travelling overseas before you go and the risk of cancellation will be reduced. Personally I travel with two credit cards, a debit card and cash and I think this gives me enough breathing room should anything go wrong. Depending on where I am going I will leave one or two cards in the hotel safe, so if I lose my wallet or it gets pick pocketed I still have a way of getting some more travel money. Lastly keep the phone numbers of your credit card company in a safe place, if you lose your cards you will need to report this quickly. I use the services of Secure Sentinel who can arrange $1000 in emergency cash and replacement of lost or stolen cards. They will also cancel your mobile phone number in case of loss, this prevents anyone else using your phone and creating a large bill that you will be liable for. The annual fee is less than AUD$90 so it is good value if you ever lose your wallet containing your travel money or your mobile phone. Read more about the Secure Sentinel range of services.